Varadkar also told Tubridy that he finds children living in emergency accommodation “offensive”. TAOISEACH LEO VARADKAR has said he does not believe the HSE is fit for purpose as an organisation, adding that a lot of “good people” work for the health service. 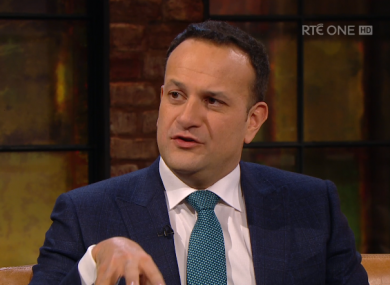 Appearing on tonight’s Late Late Show on RTÉ One, Varadkar was asked if he believed the HSE was fit for purpose, a question he answered following a long pause. “Not as the organisation is now. It’s not the best structure to provide our health service. “There’s a difference between an organisation and the people who work for it. There are a lot of really good people in the HSE,” Varadkar said. Last month, the Taoiseach was criticised for saying consultants should not take holidays in the first week of the year, particularly those who work in emergency departments, and that nurses should not take leave in the first two weeks of January. He has since acknowledged that he doesn’t have the authority to dictate when employees take leave but defended his stance. When asked about the current housing crisis, Varadkar said it was an enormous issue, one that “keeps him up at night”. “Most obvious thing is to build a lot more housing. This year we’ll have built about 20,000 homes and apartments. The only way to do it quicker is to cut corners. I’m not willing to do this again. Varadkar continued that he found children living in emergency accommodation to be “offensive”. “Particularly when it comes to kids, people find it offensive, and I find it offensive too that children are in emergency accommodation. He went on to apologise to families that are currently living in emergency accommodation adding that the Government is doing everything it can to resolve the homeless crisis. Email “'Is the HSE fit for purpose?' Not as the organisation is now, says Varadkar”. Feedback on “'Is the HSE fit for purpose?' Not as the organisation is now, says Varadkar”.